Eater LA - MTN - CalAsia Construction, Inc. | CalAsia Construction, Inc.
More often than not, tipsters, readers, friends, and family of Eater have one question: Where should I eat right now? Restaurant obsessives want to know what’s new, what’s hot, which favorite chef just launched a sophomore effort. And while the Eater 38 is a crucial resource covering old standbys and neighborhood restaurants across the city, it is not a chronicle of the ‘it’ places of the moment. Sugarfish co-founder Lele Massimini wanted to do the idealized version of the true Italian pasta bar, and Uovo just might be it. All the pasta is hand-produced in Bologna and then shipped over by air to this sleek Santa Monica space, where it’s prepared with a precise set of sauces. Italiaphiles will fall in love immediately, and the prices aren’t too shabby either for this level of pasta. Santa Monica has a new fast-casual burger contender in HiHo, which comes via Ojai. They employ wagyu beef from a single ranch in New Zealand then serve the double-patty meal with cheese, ketchup, and a plush white bun. With fries the meal comes out under $10, which is a steal for this part of town. Dave Beran, former chef of Next and Alinea, brings a major fine dining and avant garde pedigree to this tiny tasting menu restaurant hidden inside a Third Street Promenade food court. Stranger things have happened in LA, but the initial response has been very good, with well-heeled fans of world-class dining calling it a fantastic addition to LA’s upscale restaurant scene. Phillip Frankland Lee and Margarita Kallas-Lee have a companion concept to their tasting menu restaurant Scratch Bar. Though Woodley Proper has more of a cocktail bar feel, they serve a full menu late every evening, which caters to the industry crowd. Order anything from a house-made cheese and charcuterie plate to a dry-aged prime New York strip steak. Evan Funke is back in one of the most gorgeous new restaurants in Los Angeles. His latest work is Felix, an ode to Italy with pasta, antipasti, and pizza that stands up to the city’s best. Throw in wonderful cocktails and superb wine, and there are the makings of a modern classic. Good luck getting a reservation this early on, but try a seat at the bar. Instagram fiends have already descended en masse at this Australian cafe in Venice. Breakfast and lunch is the name of the game here, with stylish avocado toast, smoothie bowls, breakfast burritos, and even a burger on the bill of fare. Don’t forget to snap a photo. 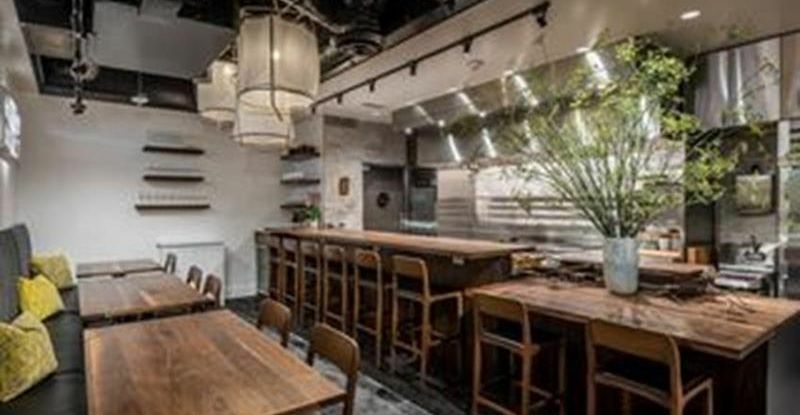 Travis Lett, who founded Gjelina and Gjusta, has finally opened his Japanese izakaya along Abbot Kinney, with chefs Pedro Aquino and Erika Aoki adding a rounded, international approach to the robust cooking. Early reviews, especially of the $20 ramen bowls, are very positive. Jordan Kahn’s hyper-concept tasting menu restaurant goes into the iconic Waffle Building by star architect Eric Owen Moss. With a pricey $250 per person menu, the food almost defies description. Some critics are already calling Vespertine the most ambitious restaurant in the country right now. Michael Voltaggio lifted his Melrose Avenue restaurant ink and plopped it down onto north La Cienega at a much larger space. The menu seems to be more encompassing as well, with favorites like steak and burgers going alongside the creative chef’s avant garde approach. It feels very much like a second season of a groundbreaking TV show. Ricardo Zarate is back with a personal project that reflects his passion for Peruvian cuisine. This bright West Hollywood restaurant goes into the former Comme Ca, and the early reports are quite positive. Try the ceviche and the grilled branzino. This sweet new Cali-Italian restaurant along Fairfax goes into the former Pitfire space, but fear not, there is still pizza on the menu here and it’s pretty fantastic. The food comes from Gjusta vet Miriello, who does everything from pasta to market-fresh vegetables to a meat charcuterie board, with service from 8 a.m. to evening that makes this one of the city’s most compelling new all-day players. One of the strangest and perhaps most flavor-forward new restaurants to open in Los Angeles, Mh Zh (pronounced mah-zeh) features rustic Middle Eastern dishes at ridiculously affordable prices. Most of the seating is outside on the patio, and the handwritten menus come on brown paper bags. Try the tahini and the lamb ragu, or the roasted cold beets. Tucked away along Sunset Blvd, this modern Mexican restaurant from chef Maycoll Calderon, who hails from Venezuela but has opened multiple restaurants in Mexico City, is another addition to the neighborhood’s burgeoning scene. Think seabass ceviche in coconut water and fresh watermelon salads with goat cheese. Or for mains, a prime NY strip steak with roasted plantain or Baja California grouper with ginger rice. Zack Pollack’s second restaurant is an ode to Italian-American restaurants, with everything from pizza, meatballs, and a mean chicken parmesan sandwich in a sleek space. The Echo Park restaurant was formerly Pizza Buona for half a century. Atwater Village lost a key part of its dining scene when Canele closed, but Journeymen is here to replace it. The scrubbed interior still feels intimate while chef David Wilcox prepares produce-driven food that also includes ethical meat and seafood. Industry veteran Matthew Kaner has finally opened his own restaurant, and it’s an intimate, wine-centric operation in the heart of Atwater Village. The mid-range menu sports everything from albacore conserva and charcuterie to California halibut with grilled rhubarb. This new Israeli restaurant is tucked into the Freehand Hotel in Downtown LA, with the kitchen helmed by Alex Chang. The fresh interior has plenty of nice wood paneling while the plates boast approachable Middle Eastern-tinted dishes that please a crowd. Steve Samson’s (Sotto) sophomore restaurant takes over a gigantic space in Downtown LA’s Fashion District, with a strong take on cuisine from Emilia-Romagna. Expect superbly built pastas and grilled meats in the stylish room. And warm weather means there’s a peaceful place to imbibe aperol spritzes on the patio. Margarita Manzke has launched her ode to Filipino cuisine inside Grand Central Market and already the lines are forming for the fresh take on comfort food. Think sisig bowls, roasted eggplant with garlic rice, and barbecue pork ribs all at reasonable prices. Karen and Quinn Hatfield have a sweet new all-day restaurant in the heart of Downtown LA, just steps from City Hall and a stone’s throw from Historic Core. Serving everything from salads and sandwiches to fresh pastas, The Mighty is a big city version of Sycamore Kitchen, their daytime player on La Brea Ave. Don’t skip desserts, which reflect Karen Hatfield’s commitment to top flight pastry.